The Franklin Township Public Library is situated on the municipal complex in Somerset County. The addition of 18,100 sf was added to the 18,300 sf existing building. The project features a high center core with the new Children's wing terraced into the landscape to one side and the Adult wing comprised of the renovated building on the other side. Day-lighting and deep overhangs reduce energy costs as well as adding design elements connecting the existing building to the new addition. This project began as a Masterplan Study for a simple interior reconfiguration of the shelving and furniture of an existing 26,000 square foot public library. The client wanted better merchandising of the popular materials, a fresh look and more efficient utilization of space. The Town Council and community were so impressed with the solutions that support was created to expand the project. In the end, this 60,000 square foot, two-level library is outfitted with contemporary furnishings, slate and marble accents and custom-designed library furniture. The exterior is designed in the Federal style of the original library and adjacent governmental buildings, the interior offers a soaring sky-lit courtyard, a neon-trimmed young adult section, and an internet cafe. Dennis Kowal Architects created two additions to the library, increasing its size by 4,500 square feet; however, the interior redesign accomplishes the objectives of the building program more dramatically than the expansion’s modest size would suggest. The brick exterior of the additions perfectly matches the original building. Entrances have been made more welcoming. Features include window seats with built-in toy boxes under them, three reading bays filled with light from multiple sets of double casement windows, and rich wood end-panels etched with trees. 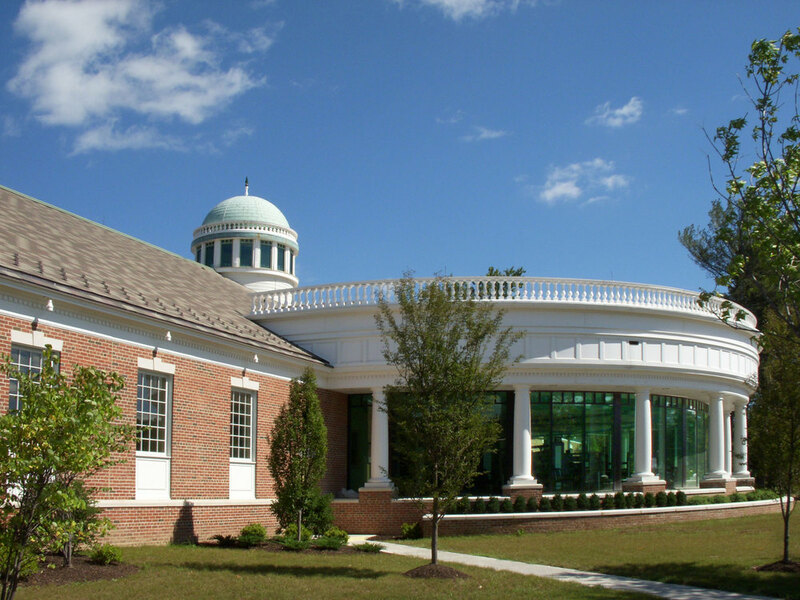 The renovated Denville Public Library is an interior re-design success. Once a vanilla box with no real differentiation, the same square footage now is a spacious and organized facility that gives patrons seating choices, views, collaboration areas, and technology. Known for its lake resort history, DKA captured the sophisticated feeling of a teak and mahogany yacht cabin in their new design. This library is on a new 8-acre site. Two sites were investigated for potential development. A feasibility study conducted by DKA compared codes, zoning, accessibility, cost and convenience. Based on our report, a site decision was made easily by the Trustees. The design takes advantage of the sloping site to create expansion space on a lower level. DKA obtained a $1,000,000 grant on behalf of the Owner for this project by preparing a full grant application. The existing Children’s Library had low lay-in ceilings and out-dated furniture. It was one big room with a story pit as its only feature. DKA reinvented the room as a rainforest theme featuring a rope bridge entrance that crosses the old story pit (now modified as a sunken pond with rim seating) A real explorer’s tent serves as the teen room and cargo boxes form the circulation desk. Exposed pipes painted various shades of green and layered soffits add an overhead “vine canopy”.